Presumption of Innocence? Not so fast. Orran Brown’s 28-page response to Patrick J. Tighe of X-1 Law’s motion seeking court intervention for multiple audits of a single settlement claim is very instructive although possibly not in the way Mr. Brown intended. In Part 1, I highlighted the gist of Tighe’s motion seeking to limit audits to one per claim versus the high stakes for the NFL in stopping dementia claims in their tracks. I pointed out how approved claims at the two-year point of the settlement have blown the actuaries on which the settlement is based to shreds, with the league poised to pay out upward of $3 billion if they are unable to find a way to mitigate their losses. The NFL’s actions seem poised to try to recap the settlement at original figures, aided and abetted by the claims administrator and the appeals advisory panel (AAP). If you question my assessment, perhaps this statement from Class Counsel Gene Locks, made a year ago, might prove convincing. Brown’s most recent statements as evidenced in his reply to Tighe leave open the question, “Fiduciary for whom?” One might note that Brown is beginning to resemble Roger Goodell (or at least his fiduciaries) in his words and actions. Under the heading of “Factual Background” Brown writes, “X1Law, a personal injury law firm in Palm Beach, Florida, represents 69 registered Retired NFL Football Players in the Program.” It’s unclear if this is correct since numerous reports, including one on law.com indicate that Tighe represents 90 players. Irregardless of the total number of players represented by X1, Brown write that “68 of those 69 registered players are eligible for the Baseline Assistance Program (“BAP”)” and seems to fault Tighe for not utilizing the BAP for the players he represents. This should be a non-issue for Brown. Many players do not trust the BAP to evaluate them fairly and as a result, do not wish to participate in the program. Of those who have, only 88 have received a diagnosis qualifying them for a monetary award. Brown says that Tighe has filed claims for 57 players as indicated in the chart below. Immediately one red flag regarding Brown’s statement catches the eye. While he says that all but one of Tighe’s clients are eligible to participate in the BAP, four Alzheimer’s claims are noted and Alzheimer’s cannot be diagnosed through the BAP, which is set up only to evaluate for Levels 1, 1.5, and 2 Neurocognitive Impairment, the first of which is a non-compensable condition. The BAP is not authorized to diagnose Alzheimer’s disease, Parkinson’s or ALS, and since dementia and Alzheimer’s often overlap, it makes sense to see a doctor who can make the higher diagnosis if he finds it applicable. While Brown draws attention to the total number of claims filed, Tighe’s motion specifically references 32 players who are now in audit for the second time. Brown states the claims were filed between June 27, 2017, and February 22, 2019. An exhibit filed by Tighe with his motion indicates that the affected players’ claims were filed between and June 27, 2017 and July 25, 2017. All of these claims were placed in audit for the first time on November 17, 2017. Brown seems to take issue with the fact that 57 of Tighe’s clients used the same doctor(s). He notes that Tighe’s law firm is located in Palm Beach, FL and the doctors are based in nearby Delray Beach and Davie, FL. As stated by Brown earlier and confirmed on the X1 Law website, X1 is a personal injury firm. As such, it should come as no surprise that Tighe, like many other personal injury lawyers, and often other plaintiff attorneys have a relationship with area doctors. Many clients who lack insurance or are insufficiently insured rely on an attorney’s referral to a doctor who will accept deferred payment so that their medical needs can be met and sufficient documentation on their conditions can be obtained. While defendants and insurers tend to frown on the practice, as Orran Brown apparently does, it is often the only way an injured person with limited resources can gain access to a doctor, or in this instance a doctor outside the BAP. It stands to reason that a defendant would prefer a plaintiff to not have medical documentation sufficient as to make a claim, but that should not be the case with a neutral claims administrator, unless he is acting as a fiduciary for the defendant. While the process isn’t entirely clear, it appears that 34 pre-effective date claims were filed by X1 Law in late June and early July 2017, and in July deficiency notices were issued, questioning the diagnostics of Dr. M. Albin Morariu, Sr. and Dr. Mircea Morariu. Apparently Tighe decided at this point to send the medical records to the nearest MAF physician, Dr. Nicholas Suite, for review. Dr. Suite concurred with the diagnoses and signed diagnosing physician certificates for the players based on his review of their medical records. This seems to be what is referenced in this statement by Orran Brown and the event that triggered placing the claims in audit. While the review done by Dr. Suite is essentially the same as a review by an AAP doctor who examines records but not the player, and records review was not prohibited in the settlement agreement, subsequent rules adopted by the parties and approved by the special masters deemed the practice unacceptable. It appears that the only change made to the records for the players was the diagnosing physician certificate, since the examinations by Dr. Morariu were relevant in both instances. Brown says they began an audit of Dr. Suite on September 22, 2017. This aligns with Tighe’s statement that he received notices of audit between September 26 and November 17, 2017, the bulk of which were noticed on November 17. According to Brown, Tighe inquired at that time as to the reason for the audit and was informed that he wasn’t permitted to use a diagnosing physician certificate issued by a doctor who didn’t physically examine the patient, so Tighe resubmitted the original certificates signed by Dr. Morariu, which seemed to be the reasonable course of action. 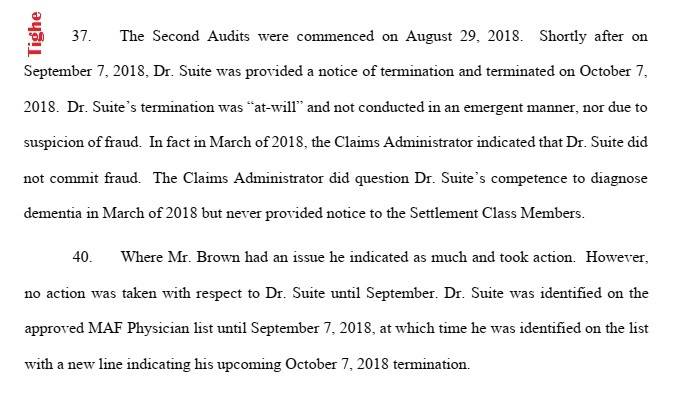 Oddly, the claims that had been reviewed by Dr. Suite were removed from audit in March 2018, but Dr. Suite wasn’t disqualified from the program until much later in the year as confirmed by both Brown and Tighe. Since Dr. Suite became a non-party to these claims when Dr. Morariu’s diagnosing physician certificates were uploaded, if there were questions regarding his diagnostics, it would seem logical for the audit to have continued in this regard instead of releasing the claims and then months later placing them in audit again based on records that had been on the portal for over a year. So much for logic. 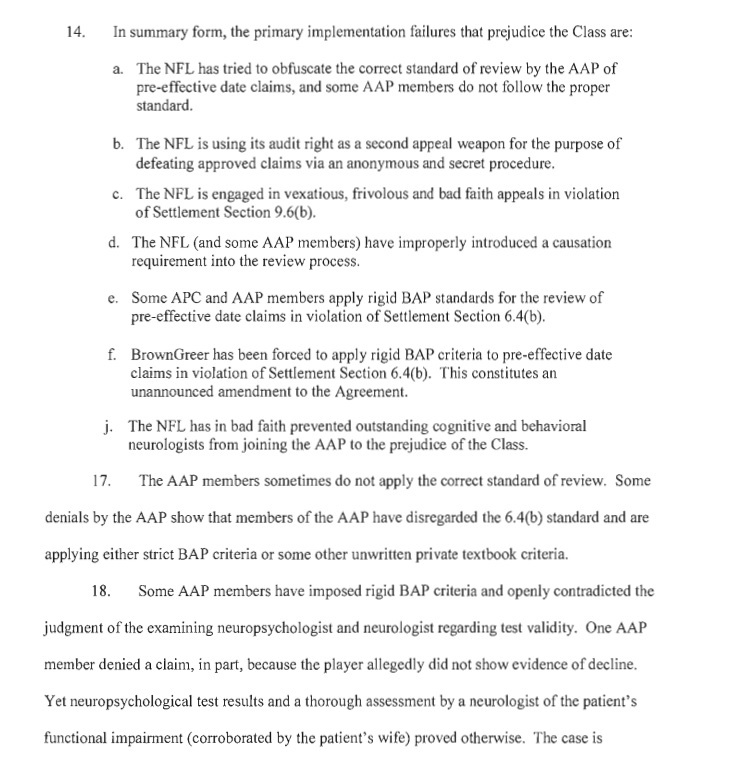 It seems the AAP, who have given the appearance of alignment with the NFL disfavored “an appearance of thoroughness.” Something tells me that they would also disfavor lack thereof. Though Dr. Morariu’s records had been in possession of the claims administrator from June or July 2017, and the AAP expressed concerns about Dr. Morariu’s diagnostics as early as February 20, 2018, instead of addressing concerns about Dr. Morariu at this time, the claims administrator released the claims from audit in March 2018, and allowed them to proceed, and didn’t pursue an audit of Dr. Morariu until August 21, 2018—which Tighe asserts was about the time a decision approving or denying the claims from the special master was expected. The timing throws logic to the wind and suggest inefficiency at best and ulterior motives at worst. The claims process in the NFL settlement has often seemed like a mirror universe to the American justice system in which someone accused of wrongful conduct is to be presumed innocent until found guilty in a court of law, or in the civil system where allegations made by plaintiffs must be construed as true until and unless the case is dismissed procedurally (and no opinion rendered as to the merits) or the case is tried with a verdict favoring the defendant. In the settlement, however, over 50% of claims have been audited. While there will be some degree of attempted fraud anytime money is involved, it seems much more reasonable to believe that a large number of players are suffering from neurocognitive impairment than to conclude that a vast number of retired players, attorneys, and doctors, many of whom are unaffiliated, to be participants in a pervasive conspiracy to defraud the NFL. 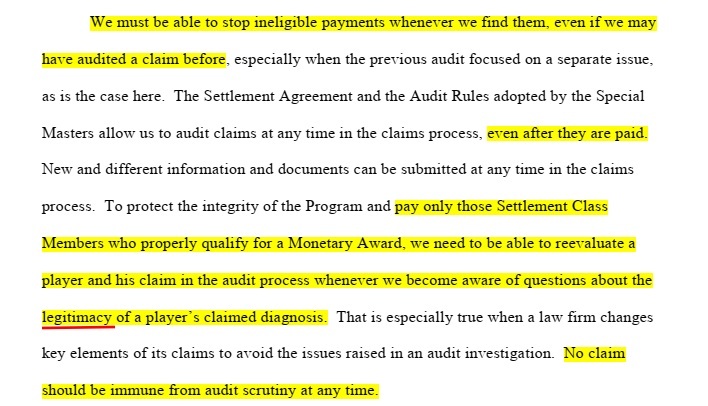 Since only 10% of approved claims are subject to random audit, per the settlement agreement, those which have not been approved but are non-randomly singled out for audit are treated as if the players, along with their doctors and lawyers are guilty of wrongdoing rather than forcing the NFL to prove wrongful conduct. From the beginning, the claims process has been onerous and moved much more slowly than class counsel indicated to players. 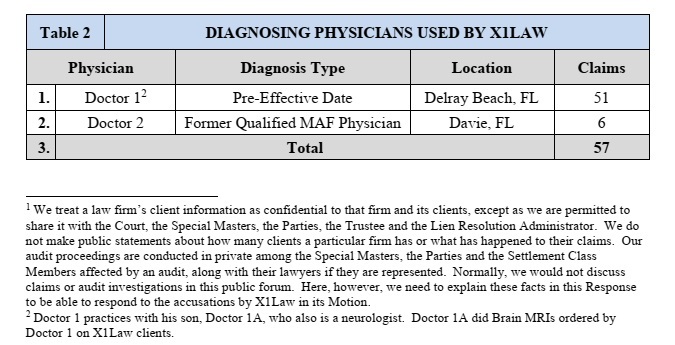 In a June 29, 2017 Town Hall Alumni meeting in Miami, he said, “If you have a diagnosis every neurocognitive, and neuromuscular problem before [January 7, 2017] and it was done by a board-certified, legitimate doctor, those diagnoses will be honored in the settlement.” Players took him at his word and submitted their claims, but instead of acceptance and rapid claim approval, as Orran Brown promised at that same meeting, everyone who indicated a player was sick was viewed with skepticism, and claims were delayed and new requirements added to qualify for payment. Tighe, was the first to publicly question how the claims administrator seemed to be deviating from the plain text of the settlement agreement in August 2017 after the claims now in question had been submitted and found deficient. Could the audits of his claims indicate retaliation? The Locks motion in March 2018 asserts that 50% of claims were under audit as of this early date. Of nearly 1,100 dementia claims filed to date only 6 have been paid as of this filing. The NFL’s projections to this Court predicted 430 dementia claims paid twelve months into implementation…More than half of all claims have been placed into audit or denied, thereby causing interminable delay and preventing payments. The NFL seeks to rig the Settlement system. This is part of the League’s DNA. Historically, it has always engaged in scorched-earth litigation, and that is what the League is doing here, making this a settlement in name only. When Locks made waves and brought media attention to the audits and unfavorable opinions of the AAP, he was fiercely attacked from all sides, including the NFL, Co-Lead Class Counsel, the Claims Administrator, and even the Court. Coincidentally, or not, there was a strong uptick of dementia claim approvals immediately following the motion and the negative attention placed on the settlement by numerous major media outlets. At the time the Locks motion was filed, approximately one year after claim submissions began, 55 dementia claims had been approved, with only 6 of these paid. Fast forward one month and the April 16, 2018 Claims Report shows 117 approvals–more than double the approvals of the previous year in the course of one month. The time immediately following Locks motion seems to be a knee-jerk reaction designed to discredit his assertions. Oddly, it was during this timeframe that Mr. Tighe’s clients were removed from audit. About a month after Tighe filed his motion asking the court for proper administration of the settlement agreement in August 2017, all his clients’ claims were placed in audit. Three days after Locks filed his motion Tighe’s claims were removed from audit. Was this intended as a deterrent to his filing joinder with Locks, as many other firms did? Or was it a move to quickly discredit Locks’ assertion that 50% of the number of claims under audit? Or is it mere coincidence? It would be interesting to know if other claims were removed from audit around the same time, but since information on the public docket is sketchy, this is the only available record. Oddly, she seemed to do a 180˚reversal from her opinion on Locks less than 3 weeks later, based on this statement from Seeger’s most recent fee petition. Since March 2018, the NFL has claimed that the settlement has been wrought with massive fraud and insisted on mass audits that have continued to tie up approximately 50% of submitted claims. Tighe’s clients, ironically had been placed in audit in November 2017 and were released from audit with no indication of wrongdoing about the time the NFL started making public accusations of fraud after the Locks motion at which time they petitioned the court for a special fraud investigator. Orran Brown’s evaluation resembles that of a hostile insurance adjustor. Though attorneys have been encouraged to suggest physicians to fill the need for MAF providers, Brown objected to Tighe’s recommendation of Dr. Morariu. Brown states that Morariu was rejected because of concerns on his background record from 1988 and 1992 in which he was alleged to have made a couple of questionable medication decisions. Whether this was a deciding factor is debatable. Gene Locks expressed concerns since he, too, had made recommendations for a doctor similarly questioned and rejected from the AAP program. It’s unknown if any doctors recommended by attorneys representing individual players were accepted to the program, however, none of the AAP apparently believe in CTE, if Locks’ statement is an indication. In a status report dated February 15, 2019, Brown indicated that AAP were now recommending doctors for vacant MAF positions. This correctly or not gives an appearance of attempting to skew the MAF toward the NFL’s very rigid stance on claims. Questions about the neutrality of the AAP have been ongoing. Consider these excerpts from the Locks motion as he points to the ways AAP review has compromised players. And, consider this—straight from the NFL. The parties did not personally interview these [MAF] physicians or train them in all aspects of the Settlement program. On the flip side, the statement would imply that the parties, or at least the NFL did personally interview and ‘train’ the AAP, which would underscore their reasons for insisting on AAP consultation and offer additional credibility to Gene Locks’ descriptions of NFL manipulation. Brown says the AAP was “puzzled” the doctor had performed “the same analysis and tests for almost all players that he examined.” I’d find it more puzzling if a doctor, performing examinations for the same conditions, had no consistency with his testing. Even the vaunted BAP outlines recommended tests that the NFL would apparently like to see carried out verbatim. Many words were used to relay the AAP’s finding of fault with both Dr. Morariu’s choice of tests and the results of the test, including an MRI, which is over and above recommended testing at the MAF level and not available through the BAP. According to Brown, 53 claims have been submitted by X1 Law. According to Dr. Morariu, he evaluated 60 to 70 players and a high percentage of them had cognitive and functional impairment. What I would derive from this information is that X1 Law represents around 90 players and referred the ones, based on his judgment, that might have sufficient cognitive impairment as to qualify for an award to Dr. Morariu for examinations. Dr. Morariu found most of them to be impaired. Brown also inquired of Mr. Tighe. He told Brown that the players under audit had been found to have a qualifying diagnosis. It doesn’t appear that he discussed the other players who were not diagnosed and therefore not under audit, that Dr. Morariu referred to. 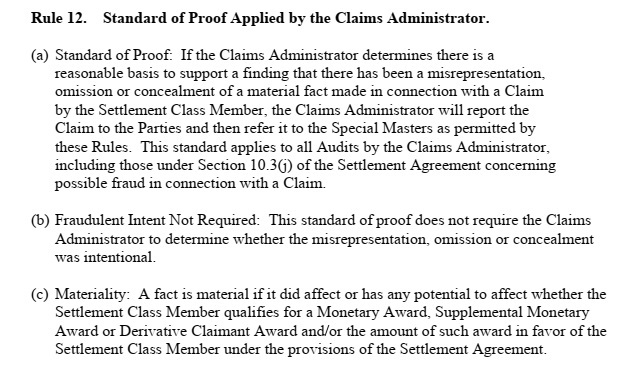 Likewise, I can’t imagine that an attorney would submit claims for any client who didn’t have a qualifying diagnosis, so it would stand to reason that all submitted claims had received a qualifying diagnosis from the board-certified neurologist as required by the settlement. The typical standard of evaluation in a civil matter is “preponderance of the evidence” meaning that an outcome is “more probable than not.” Plaintiffs allegations (or in this case diagnoses) should be construed as true unless proven otherwise. In the settlement, a higher standard is required, that of “clear and convincing” evidence which falls just under the “beyond a reasonable doubt” standard used in criminal cases. This should mean that clear and convincing evidence, and not just a possibility, or even slight probability that something is amiss should govern how players’s claims are evaluated, with the burden falling on the NFL. I’ve seen much of the evidence they’ve presented. Most is circumstantial – a video from a few years back in which a man seems to be lucid; photos of a player on the sideline of a game or on a golf course. A doctor diagnosing a large number of patients. To me, this is not clear and convincing. Orran Brown goes into detail in explaining and defending the audit process, which is quite instructive to review. He claims authority for the audits through Rules Governing Audit of Claims, adopted on January 26, 2018 by the special masters. It’s worth noting that the audit procedures in the Rules go much further than the explicit audit provisions in the actual settlement agreement. Number 4 seems to be the trigger for the claims submitted by Mr. Tighe, but as I noted previously, this is quite normal. What would seem less normal is if an attorney is referring players to a doctor halfway across the country, or if he has multiple cross-country connections with doctors—in fact, in other filings where claims were under scrutiny, attorneys were criticized for utilizing physicians outside their geographic area. That leaves a question. Where should an attorney refer his clients if not to a local doctor or a doctor outside his local area? Is he supposed to try to locate a different doctor for all his clients? With only 127 MAF doctors currently in the system, there are going to be many examinations rendered by the same doctors going forward. After a decision is made to audit a claim or claims, Brown describes how it is initiated. Brown says his objective as spelled out in Rule 12 is to determine if there has been a “misrepresentation, omission, or concealment” regarding a claim. Though he is not required to determine intent, Brown’s inclinations tend to project as if he presumes wrongdoing and it’s up to the player’s attorney to change his mind. Now that the NFL has been granted its request for a special fraud investigator, who is authorized to determine intent, the chilling effect of such, doesn’t seem far away. The Claims Administrator says that he works under the authority of Rule 10, which grants subpoena power to pursue whatever information he seeks. Brown says that if no “misrepresentation, omission, or concealment” is found, the claim is released and processing continues at the point at which the audit was initiated, but if the opposite occurs, the audit is sent to NFL and Co-Lead Class Counsel, and if either party wishes it to move forward, it is sent to the special masters who are tasked with making a final determination. If the special masters accept the audit, the class member or his attorney, if represented, is notified. From that point the special master will conclude as described below. Brown seems to lack understanding as to the torture these incessant audits inflict on impaired players. Regardless of if they are ultimately deemed eligible for compensation, many symptoms that were part of the initial lawsuits, including emotional instability, were excluded from the compensation available through the settlement. That doesn’t negate the existence of such conditions or the need to act compassionately, and with care as not to trigger volatility or suicidality. Unless better practices are adopted, I fear the trauma this inflicts will eventually result in a death. This could more easily pass for a statement from the NFL’s counsel at Paul Weiss than the words of a “neutral” claims administrator. It’s possible that the claims administrator will decide there’s nothing to see and release X1’s claims before Judge Brody rules on the X1 motion. Based on observations of the settlement thus far, I consider that outcome to be a longshot. Much of the activity in the settlement seems to be reactionary and sometimes punitive. Without people like Tighe, who are not deterred from using the public docket, journalists, players, and the public would have little reliable information from which to evaluate the settlement. This appears to be the desired outcome based on Judge Brody’s preference for off-docket filings. It also leaves dissenters open for retaliation, and might explain why, more voices of dissent haven’t surfaced. Consider this excerpt from University of Georgia Law Professor Elizabeth Chamblee Burch’s pivotal analysis of repeat players in the plaintiffs’ bar. This would explain why aside from the Locks motion; few prominent members of the plaintiffs’ bar have gone on the record about the issues marring settlement implementation. It also demonstrates that his motion was an extreme and unusual tactic. Those with the most power within the settlement immediately worked to shut down Locks and those who joined with him, and Locks’ appointment to work with the lenders appears to be a carrot dangled, forcing him to reconsider his “lack of cooperation” and choose between pleasant and unpleasant consequences. While I’ve been accused of making unfounded speculation regarding the settlement, I contend my analysis is on solid ground. “Stressing cooperation deters dissent;” one must take this at face value or believe quite strongly in coincidence. Patrick Tighe is a personal injury attorney, who typically represents people in individual litigation where this unspoken rule doesn’t apply, and it would seem he’s ruffled some feathers. Professor Burch states that the attorneys within “the club” as I tend to think of it, “will reveal that kind of information only if solicited privately.” I have found this to be true. Based on Judge Brody’s prior rulings, I don’t anticipate that Tighe’s motion will be granted, although I believe it should be. The NFL, through the claims administrator should not get unlimited bites at the apple to discredit dementia diagnoses. Especially in the area of a 1.5 Neurocognitive impairment diagnosis, evaluation should be individual and not forced into a T-Score trap that isn’t necessarily reflective of a player’s true condition. 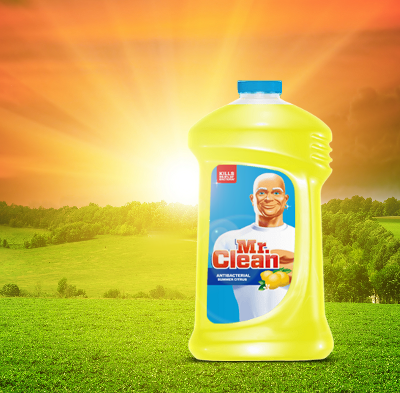 It’s often been said that sunlight is the best disinfectant, and this is something sorely missing in most mass tort settlement implementation phases. Without this sunlight plaintiffs will continue to be compromised without any public awareness of what is taking place. Here’s another piece of the puzzle brought out in Professor Burch’s article. Seeger negotiated with the NFL for $112.5 million in common benefit fees, leaving his true advocacy in question. Not only did he derive his compensation from the defendant, independent of what players actually collect or how many of them qualify in the settlement, the court decided to cap contingency fees for lawyers representing individual players, while simultaneously allowing the claims process to become so burdensome that some attorneys have felt it isn’t cost efficient to stay in the litigation, and releasing their clients. The claims administrator, Orran Brown, was jointly selected by both the NFL and Seeger, and approved by the court. This explains Brown’s interest in appeasing the NFL, Co-Lead Counsel’s position of not pushing too hard against the NFL, and the judge’s position of wishing her appointees and by extension, herself to appear in the most flattering light. It also explains why pesky lawyers outside the circle are at times, treated with contempt, for shining flashlights in the dusty corners. Model rules require an attorney to vigorously advocate on behalf of his client, but when mass litigation replaces individual lawsuits it’s impossible for a single attorney to represent the best interest of all claimants, and it appears that sometimes the most vigorous advocacy of class counsel is self-centered and self-motivated and achieved through cooperation with the defendant. Seeger did a good job negotiating for those who most closely resemble the lead plaintiffs; the late Kevin Turner, who succumbed to ALS and is representative of those afflicted with neuromuscular disease and Shawn Wooden, who is presently unimpaired and represents the category of players who will benefit from the BAP, in preserving a baseline should they experience problems later in life. Those outside these categories must rely on their personal attorneys to ensure they are not left out in the cold until they’re so ravaged by dementia, they are unable to benefit from whatever relief may be granted. Sadly, it seems players, lawyers, and doctors alike will become victims of a system stacked against them, as the NFL continues its scorched-earth campaign with few checks and balances. Update: On March 19, Orran Brown filed an Amended Response primarily correcting some previously asserted dates, including the February 2018 query by AAP.